I always think back to building dioramas for middle school English class as a component to a book report… but I think the first real experience working this way was in 10th grade. I had a serious surgery to correct pectus excavatum, a chest deformity. After having my ribs spread apart, xyphoid process shifted, and sternum moved around, I was stuck in a bed for a while. My father had purchased a kit for me to build a miniature half pipe. The half pipe was for fingerboards, those mini skateboards that were popular for a minute. I never found any interest in fingerboarding, but have really vivid memories of building ramps, then covering them with pencil drawings of skate brands and punk music imagery. 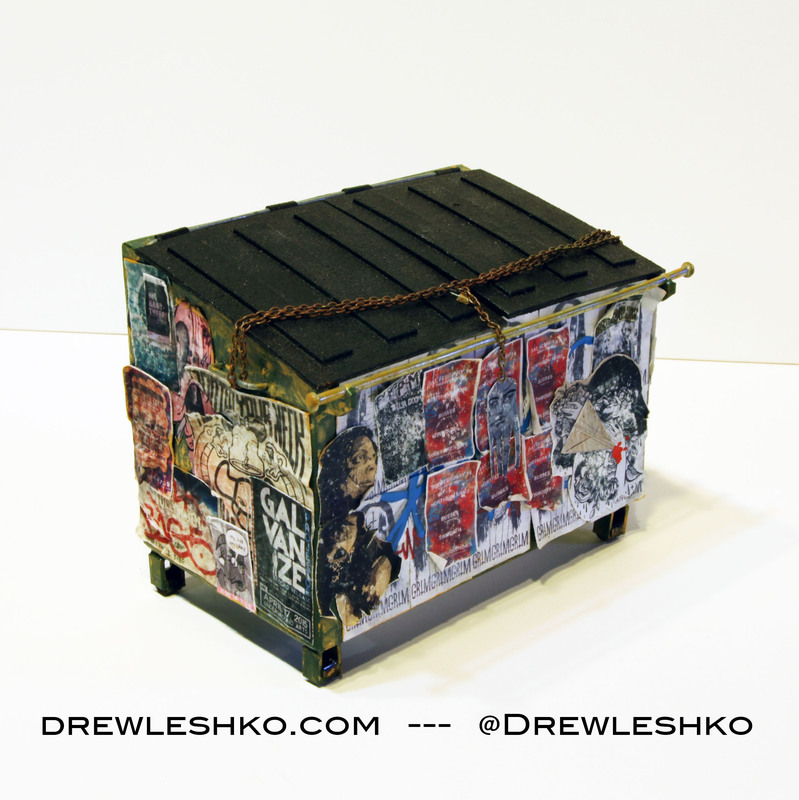 A technique not too far off from the way I’m working now when applying street marketing and graffiti to my miniature dumpsters. Were you formally trained in the arts? I studied fine art in college and feel that I developed some strong composition and design skills, but honestly the way I work isn’t taught in schools. My 3-D design class really opened my eyes and focused my attention on making dimensional objects. However, now I make my sculptures mainly out of archival papers and paper sculpture, which just doesn’t fall into any of the class programs. How long have you been creating minis? I’ve been creating small sculptures for the past 10 years, but I feel like I’ve really focused my work and found a strong rhythm in the past 5 years. Now, I predominantly work at 1:12 scale with a variety of acid-free materials. What types of miniatures do you make? How has your work evolved? I started making architecturally based miniatures to be displayed on a tabletop or pedestal. 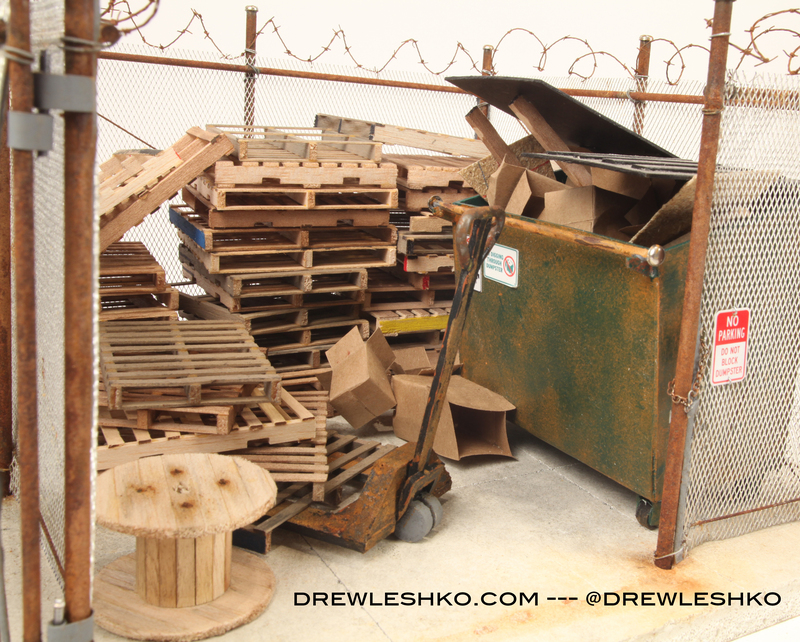 I realized that I was running out of storage space in my studio and that any potential collector would need to devote so much space to show the works in a domestic setting, so I needed to make a revision. Eventually I came up with the idea of creating the works as only facades so that they could be wall mounted. My thought was that people are able to clear wall space much easier than floor space. At this point, it’s not much different from the way a painting or photograph is hung. The buildings are huge undertakings and take a lot of time and patience. Additionally, they can be brutal to ship around the country. So I began to think about some smaller sculptures I could make, but most importantly, what type of objects can be constructed of paper? Thinking about some of the detailing on the buildings, I realized that recreating sheet metal with paper is great. 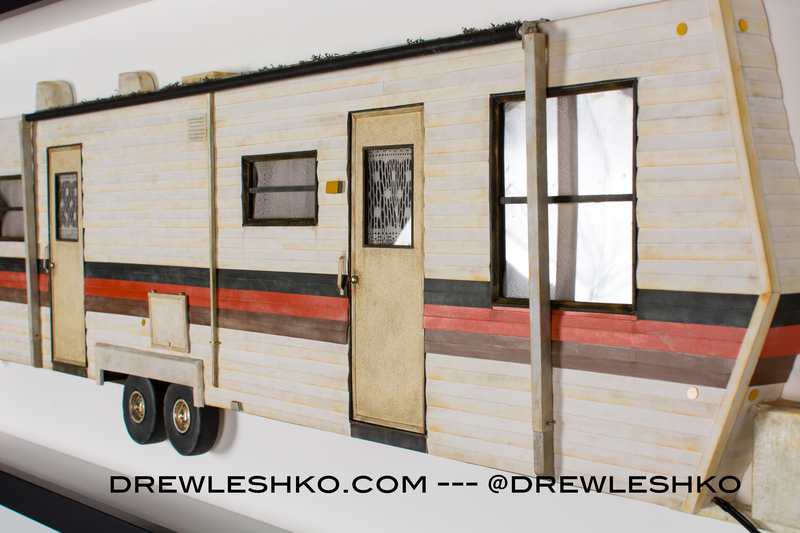 I started to think about tractor-trailers, vans, food trucks, and similar vehicles when I landed on camper trailers. 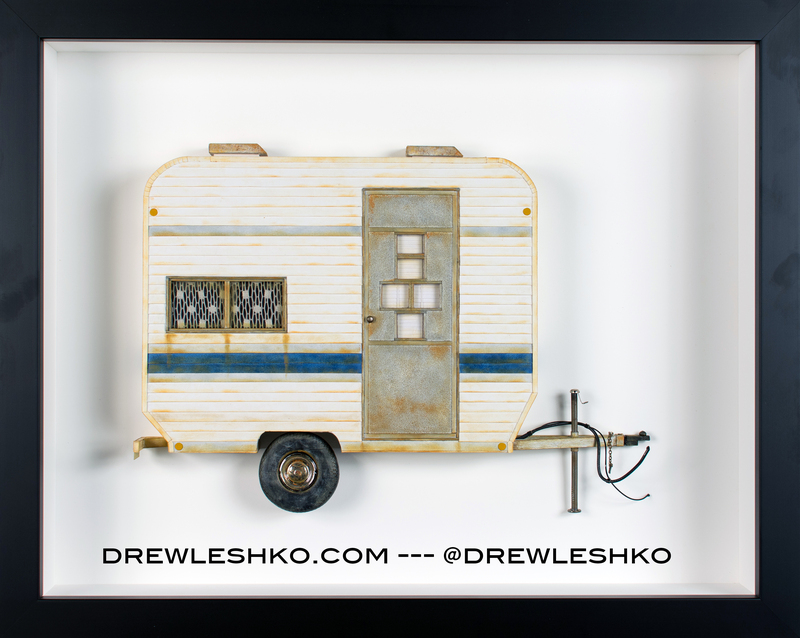 My work has always included commentary on the temporal nature of things, so the transient nature of “RV culture” fits right in to that idea. You’ve created a number of documentary studies of architecture from your Philadelphia neighborhood. Do you foresee creating building replicas of other cities? It’s hard to say. Right now, I’m very happy to be done with the buildings and to be working on a new series. I spent a portion of my life designing and creating the 17 buildings and I’m a bit burned out on them. I love using paper. It’s extremely versatile. It can be easily manipulated, folded, cut, sanded. Illustration board, mixed archival paper, wire, plaster, varieties of wood, and inkjet prints are the main materials for most of my projects. I then finish them with enamels, acrylics, airbrush, oil pigments, and charcoal. X-ACTO knife, without a doubt. Unexpected material you’ve used in your work? I learned of a rusting technique from an amazing artist, Alex Lukas. Mixing hydrogen peroxide, iodized salt, and white vinegar results in a solution that will rapidly rust steel. It can be sprayed on surfaces, or applied with a paintbrush. Sometimes I’ll add pieces of metal to the works. This is a great solution for weathering. If you could only describe your work in one of these words, which would it be? Art. Miniature. Design. Architecture. Art. This isn’t a hobby, this is my job and I am a sculptor. They aren’t models for something to be designed or constructed either. Actually they are the opposite. A recreation of what was. With that mindset, they are documentary studies similar to a painter rendering a scene or a photographer capturing an image. What’s a day in the studio look like? A day in my studio is an exercise in patience! Everything is a slow process, so patience is a virtue. Typically it’s me cutting, gluing, and folding paper to create individual components that become integral parts of the overall sculpture. I try to break down the objects into manageable pieces and then apply them like a collage to the panel I’m working on. All of this typically happens to a soundtrack of hip-hop and punk rock, though I listen to a wide variety of music. Favorite miniature or work of art you own? Oddly enough, I don’t collect miniatures, but I have a pretty nice art collection. I own two hand-woven tapestries from one of my favorite young artists, Erin M. Riley. If you don’t know her work, you need to. Most treasured miniature you’ve made? I think Ampere Electric is my most treasured artwork, though I didn’t treasure it enough to keep it, haha! This piece was collected by Kasseem Dean (Swizz Beatz), and is now installed in his home; part of an amazing contemporary art collection, The Dean Collection. I love the balance of beauty and decay in the piece. Non-miniature artists, designers, books you look to for inspiration? 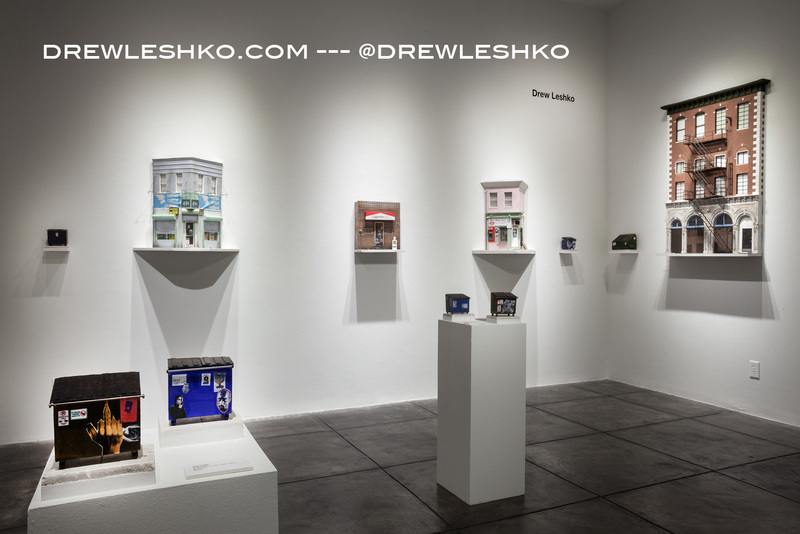 Thomas Demand, Bernd and Hilla Becher, Walker Evans, Roxy Paine, Alex Lukas, and William Christenberry. Miniaturists or mini makers that inspire you? EVOL, Tracey Snelling, Lori Nix, Lois Renner, Kim Keever, Thomas Doyle, and Patrick Jacobs. Most memorable moment in your miniature making career thus far? Last December in Miami was amazing. Art Basel, Miami, is always a great time but last year was wild. 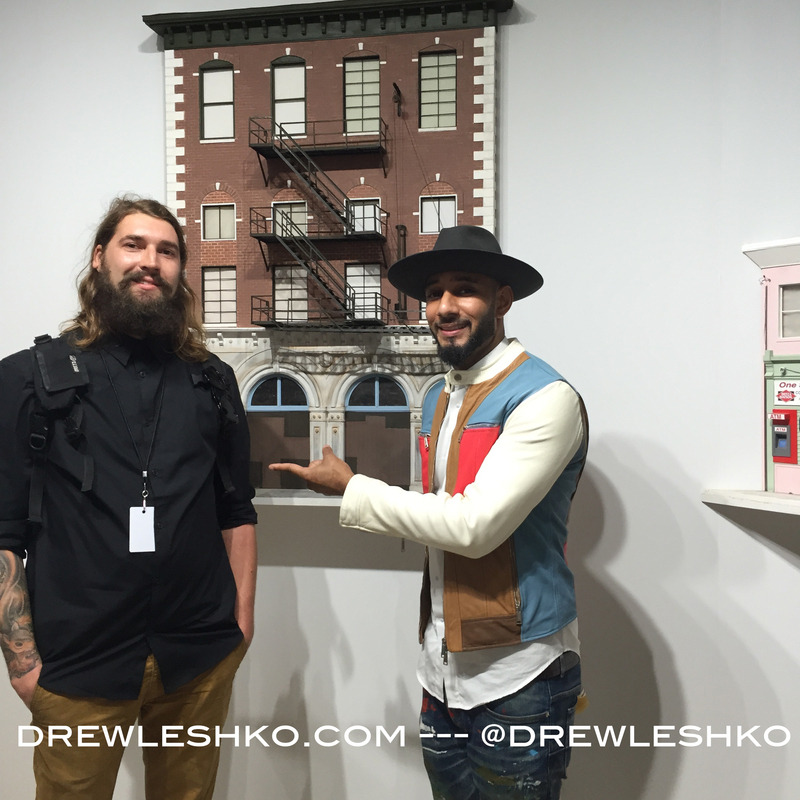 Philadelphia’s Paradigm Gallery + Studio sold Ampere Electric to the Dean Collection and I was able to meet the legend, Swizz Beatz. He was the most genuine, nicest, collector ever. 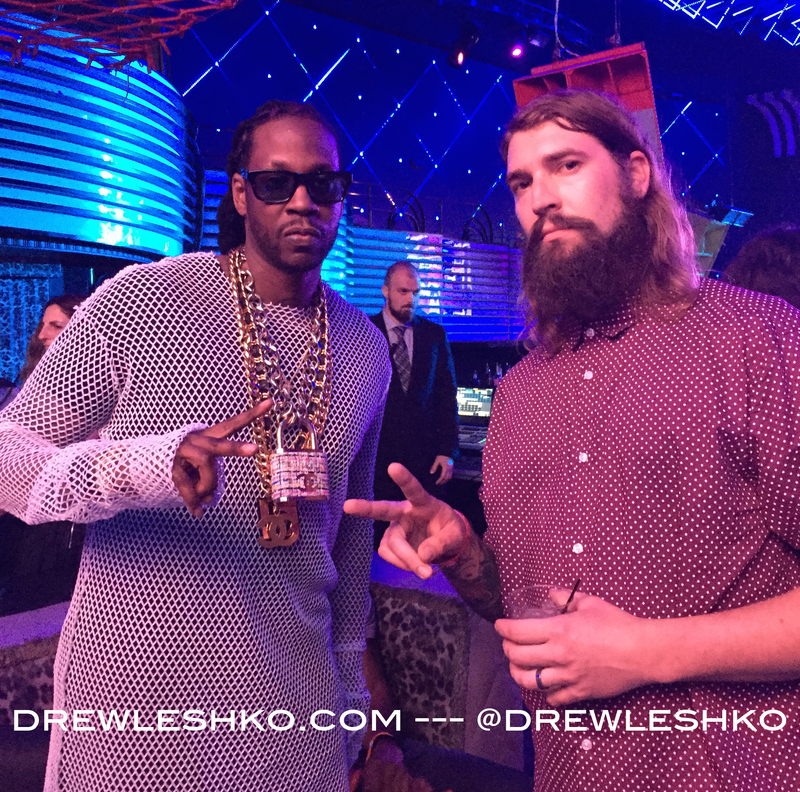 At a party Swizz was DJ’ing, I then got to hang out with 2 Chainz. 2 Chainz and I had a nice conversation about one of my sculptures Caring Pharmacy and the impact of pharmaceutical dependency and addiction in urban areas. I think that trip will stick with me for a long, long time. You only get out of it what you put into it. Making a go at an art career is difficult at best. If you’re not willing to 100% of your focus into the work, then you should find something else to do with your time. Don’t get frustrated, it took me years before I was starting to get included and invited into good exhibitions. What is the most memorable miniature you’ve ever seen? Lee Stoetzel created miniature McMansions entirely from McDonald’s food products. The finished work is a photograph, but definitely a weird one. Why miniature studies of your neighborhood? Why miniatures? I’ve always been interested in documentary studies in art, capturing moments in time regardless of media. My project with the buildings in my neighborhood is just that, a documentary project or archiving project. “Why miniatures?” is a great question, one that I really can’t answer. It just feels right. There is something inside of me that pushes me to take on these works, but I can’t identify what that is. News about upcoming exhibitions and shows? Yes! I have a solo exhibition, Relics, with 11 building sculptures at the Delaware Center for Contemporary Art, Wilmington, that will be up through mid-August. Thinkspace Gallery, Los Angeles has curated my work into upcoming exhibitions in Detroit, Fort Wayne, Indiana, London, Miami, Honolulu, and Los Angeles. In June, I have a summer group show at Hashimoto Contemporary, San Francisco. Paradigm Gallery + Studio will be taking my work to Art Basel, Miami, in December and also hosting a solo show in Philadelphia in March of 2016. Beyond that, I will have a small solo show in Portland, Oregon at Antler Gallery in the fall of 2016. What’s the best way to purchase your work? My work can be purchased online through Paradigm Gallery + Studio. Additional works are currently available through Thinkspace Gallery, Los Angeles and Hashimoto Contemporary, San Francisco and the Delaware Center for Contemporary Art, Wilmington. For works at these galleries, inquire for a price-list as they’re not listed on their web shops. When I’m not in the studio, I like to enjoy family time with my wife, dogs, and cats. Cycling, camping, and fishing are some of my hobbies. Motto that keeps you creating? 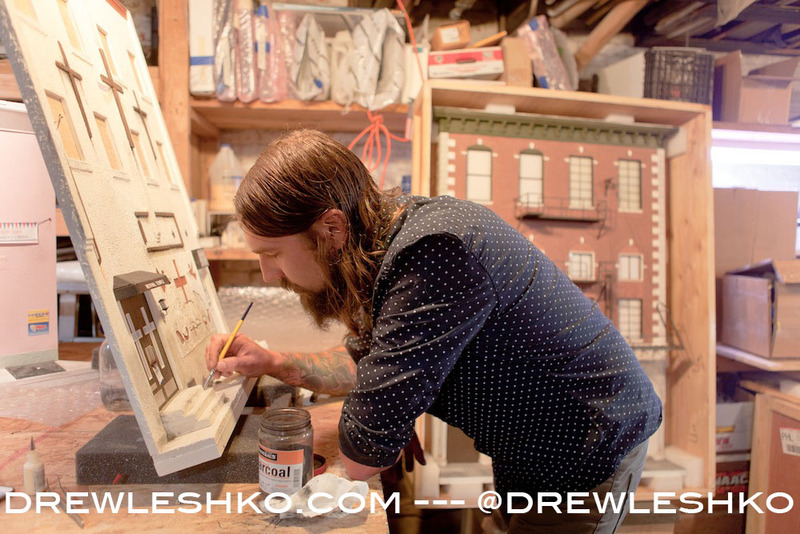 Want to dive into more of Philadelphia-based Drew Leshko’s miniature worlds? Check out his website, latest blog posts, and follow along on Instagram, which Drew uses to show daily process images as well as a vehicle to promote work to a new audience.